What is meant by Placement? The process of securing a place in a course at a university in Australia. Who carries out a Placement? This is conducted by Australia Awards Office. This occurs usually about 2-3 months before the commencement of your IAP. For semester 2 commencements, university course selections must be submitted to Australia Awards by mid-February. For semester 1 commencements, university selections must be submitted to Australia Awards by mid- August. Who are the Australia Awards Long Term Award team? How can I fully access information on courses that are available for study at Australian Universities? Please visit Commonwealth Register of Institutions and Courses for Overseas Students (CRICOS) website. This will provide you with a number of Australian education institution course databases. It is suggest you start with the Studylink database and consult with the Information Technology teacher in your Pre-Departure Training if you have any questions regarding this. How can I access counselling on the selection of my university course? Australia Award will provide a mobilisation briefing in the middle of the pre-departure training at IALF Jakarta & Bali. Australia Awards also provides a fortnightly roster counselling sessions for awardees. The Roster is organised by Australia Awards and IALF during the pre-departure briefing. Is there anything that I need to be aware of during the placement process? The most important thing to remember is to read the university admission requirements carefully. Some universities will require additional information to that already supplied to the Australia Awards office with your application. If you do not supply the required information as specified by the university, this will considerably slow down the placement process for you. How can I check on the status of my placement during this period? Who pays for the medical checkup? Australian Government covered an initial medical checkup. The additional medical checkup as requested will be considered by Australian Government as per case basis. When should I have my medical checkup? Can my own doctor perform the medical checkup? What is the processes to undertake the medical check-up? You will need HAP (Health Assessment Portal) Letter to be able to conduct the medical checkup at the appointed Panel Doctor or Hospital. In order to get HAP Letter, you will need to submit a 157A form and 956A form to Australia Awards for PDT in Jakarta and IALF Office for PDT in Bali. Australia Awards will liaise with you during your PDT regarding the deadline to submit the forms. Will the doctor provide me with the result of the medical checkup? No, the results will be forwarded directly to DIAC at the Australian Embassy. If a medical problem is discovered, you will be contacted and a course of treatment recommended. It is your responsibility to undertake and pay for this treatment. In some cases your departure to Australia may be delayed or postponed as a results of this treatment. Do my spouse and children have to undertake a medical checkup? Yes they do, however children under 11 are not required to have an x-ray. Can I defer commencement of my studies in Australia? Requests however are handled on a case-by-case basis, but you must remember the conditions under which you were awarded an Australia Awards Scholarships – that is that you are available to undertake your scholarship from the commencement of Pre-Departure Training through to the completion of your Scholarships in Australia. Does the Australia Awards office apply for my passport on my behalf? No, organising the passport is your responsibility. When do I apply for my passport? Public Servants can only apply for a passport (blue) after they have received a full offer from a university. However you can ask for a Surat Pengganti Offer from the Australia Awards office to start the process of obtaining a passport after you receive a Conditional Offer from the university. Non-public servants can apply for a passport (green) at any time. When do I submit my passport to the Australia Awards Office? We must receive the passport at least 3 weeks before your departure to Australia. Where do I collect my passport after the visa has been issued? The passport will be ready for collection at the Australia Awards Office (Jakarta departures) or from the IALF (Denpasar departures). The air tickets will also be available for collection with the passport. Is it my responsibility to obtain a student visa? No, the Australia Awards office will arrange your visa. Australia Awards covers the cost of your visa. Australia Awards will also arrange the visa for your spouse and children, however you must cover the cost of these additional visas. It is recommended that you apply for a student visa (Form 157A) early in your Pre-Departure Training. The visa application form will be given to you by the Australia Awards team. What airline will I travel with? You will travel on Qantas or Garuda depending upon which airline has the travel schedule most suitable for the timing of the start of your IAP. Where do I collect my air ticket? You will collect the air ticket (and passport) from Australia Awards Office in Jakarta or IALF Bali depending upon your point of departure. Who is the contact person for ticketing? Australia Awards covers the cost of an initial medical checkup. Any additional medical checkup that is required will be considered by Australian Awards on a case by case basis. You must have a medical checkup prior to departure to Australia. Medical checkup is occurred to the appointed panel doctor or hospital which will arranged by Australia Awards Office. You will have a medical checkup arrangement during your pre-departure training in Jakarta and Bali. Pre-Award Officer will communicate with you in the future. The result of medical checkup and the X Ray are valid for 12 months. Please bring with you the HAP Letter and ID card (valid KTP or passport) when you come to the appointed panel doctor or hospital. Do Australia Awards cover cost relate to taking my family to Australia? No. Australia Awards only support dependent visa for student taking family to Australia. Do I need permission to have my spouse and children accompany me to Australia? Yes, you need to receive permission from the Australia Awards Student Contact Officer before you make arrangements for your spouse and children to accompany you to Australia. Who arranges the schooling for my children? This is your responsibility. The Australia Awards Student Contact Officer at the university may be able to advise you on the location of schools in the area in which you have chosen to live. You are encouraged to research schooling options for your children in advance. Do I have to pay for school education for my children? No, school education is free for awardees' children. It is paid for by each State Government. You may need to cover some small additional charges yourself. What records do I need to show to the school at which my children enrol? You will need to present an Immunization Card and school reports for an application to a Government School in Australia. Both sets of documents will need to be translated into English, so that school staff in Australia can read them. You will need to talk to the Australia Awards Student Contact Officer about this. Generally there are childcare facilities on campus but it is often difficult to get a place at these facilities. You may need to look for childcare facilities outside the university campus and these can be very expensive. 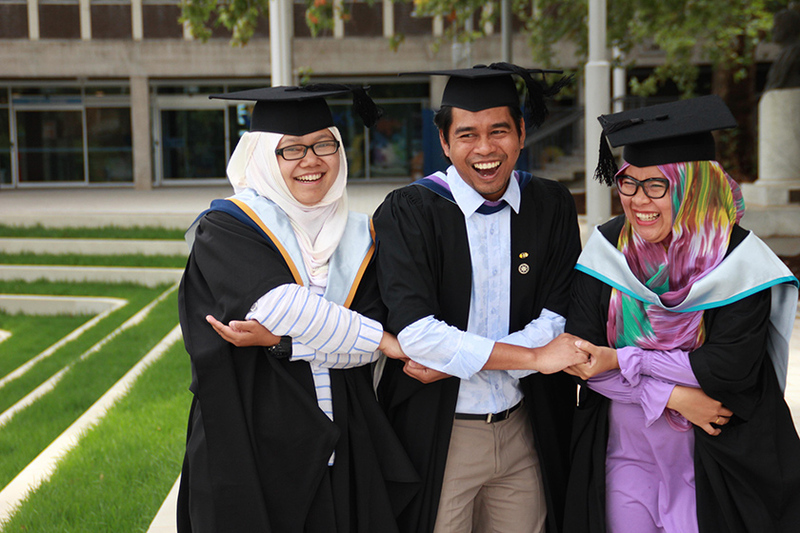 Most awardees utilize the network of Indonesian students in their Australian university community to assist with the provision of childcare services. NOTE: In December 2006, DIAC introduced financial requirements for Australian Government scholarship recipients. If you are planning to travel to Australia with two or more children, you will need to discuss the financial requirements with the Placement staff. Is financial assistance provided to travel back to Indonesia to meet with my immediate family members, if I study in Australia without them? It is only available to awardees who have successfully passed 80% or more of their units in the first 12 months of study. Can an awardee use the Reunion Airfare to visit another country? No the Reunion Airfare is only available for a return visit to Indonesia. If the Reunion Airfare is not used, can the awardee receive a cash payment instead? Can the awardee change their mind about receiving a Reunion Airfare? No, an awardee must notify Australia Awards office of their intention to take up a Reunion Airfare when they sign the Student Contract after receiving an Unconditional Offer from an Australian University. If this has not been done, an awardee cannot change their mind and request a Reunion Airfare during the period of the scholarship.